Hundreds of callers to the Presidential Hotline have nothing but praise for the way their complaints were handled after contacting the Presidential Hotline. These satisfied callers confirm President Zuma's statement that the Presidential Hotline is not only a public relations exercise. He said that each call would be treated as if it were the only one. Satisfied callers who have written letters to thank the Presidential Hotline, include assistant pharmacists who didn't get a salary upgrade and pensioners who didn't get their grants. In 2007, Amit Somaru applied for a disability grant for her mother, but the application was turned down. Somaru never gave up. She continued to apply on behalf of her disabled mother without success. This changed after 14 September when a call to the Presidential Hotline, 17737, led to her mother now receiving her grant. "I would like to thank you all and The Presidency for assistance in helping my mother to get her grant. The President's Hotline is one of the best things ever to come about," said Somaru. Johannesburg resident Thobeka Daki called the hotline to complain that City Power had been overcharging her for her lights account. After calling the hotline, City Power discovered the billing problem in her account. Daki was refunded the overcharged amount. Free State assistant pharmacists Siphiwe Baloyi and Maphakisa Mosuwe had been trying to have their salaries upgraded since October 2008, but could not get help. Within a few weeks after calling the hotline, the assistant pharmacists received their upgraded salaries. 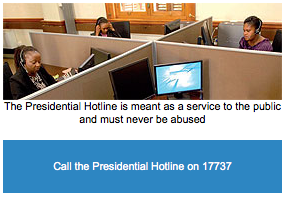 "We appreciate what the Presidential Hotline has done for us. This goes to show that our government is really determined to work for its people and solve our problems. We are very grateful," said Baloyi and Mosuwe. Pretoria resident Angelique Fourie applied for an ID for her son Aubrey in May last year and heard nothing from the Department of Home Affairs until she called the Hotline in September last year. After following up her complaint, the hotline told her that Aubrey had to have his finger prints retaken at the Centurion office of Home Affairs. "I was very impressed by your quick response and all the help you have given so far," said Fourie. Another caller, Caroline Mahlangu from Rosslyn in Pretoria also had praise for the way the Presidential Hotline helped her. This was after local police failed to open a case against a stalker whom she said also watched her when she was bathing. The local police said it was not a serious matter and they didn't open a case. A few days after reporting the matter to the hotline, Captain Manganyi from the Rosslyn Police Station met her and they opened a case against the stalker.